Definition at line 74 of file desktopbar.h. Definition at line 86 of file desktopbar.h. Definition at line 40 of file desktopbar.cpp. Definition at line 53 of file desktopbar.cpp. Definition at line 426 of file desktopbar.cpp. write code for taskbar being at sides or top. Definition at line 528 of file desktopbar.cpp. 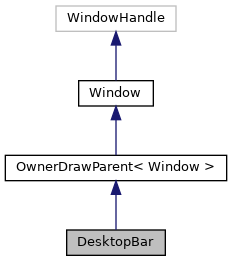 Definition at line 64 of file desktopbar.cpp. Definition at line 86 of file desktopbar.cpp. Definition at line 377 of file desktopbar.cpp. Definition at line 512 of file desktopbar.cpp. Definition at line 250 of file desktopbar.cpp. Definition at line 238 of file desktopbar.cpp. Definition at line 396 of file desktopbar.cpp. Definition at line 486 of file desktopbar.cpp. Referenced by Command(), ProcessHotKey(), and WndProc(). Definition at line 277 of file desktopbar.cpp. Definition at line 111 of file desktopbar.h. Referenced by Init(), ProcessCopyData(), Resize(), and WndProc(). Definition at line 112 of file desktopbar.h. Referenced by Command(), Init(), Resize(), and WndProc(). Definition at line 113 of file desktopbar.h. Referenced by Init(), Resize(), and WndProc(). Definition at line 115 of file desktopbar.h. Referenced by Init(), and ShowOrHideStartMenu(). Definition at line 110 of file desktopbar.h. Definition at line 117 of file desktopbar.h. Referenced by Init(), ProcessHotKey(), and ShowOrHideStartMenu(). Definition at line 96 of file desktopbar.h. Referenced by Init(), and Resize(). Definition at line 95 of file desktopbar.h. Referenced by DesktopBar(), and ~DesktopBar(). Definition at line 126 of file desktopbar.h.